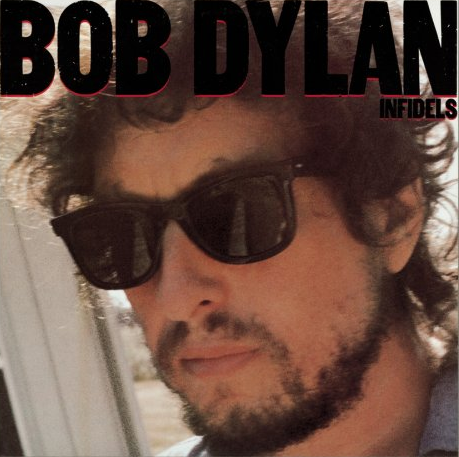 Infidels is considered by many to be the lone bright spot in the Dylan catalogue of the 1980s (Oh Mercy sneaks in just under the wire at the end of 1989, lending a hand to a decade that many are willing to write off entirely). It’s the first album after the born again trilogy, and it benefits, in the eyes of many, from the absence of testimonial and religious songs, the improved production, and a pretty decent band. Since I’ve come to like all three of the born again albums (to varying degrees), I haven’t found Infidels to be such a substantial upgrade. I think it is quite akin to the those albums, and pretty consistent in particular with Shot of Love. There’s a lot to like here, and a lot not to. I’m going to skip the first two songs, “Jokerman” and “Sweetheart Like You”, since they were singles in 1984 and I want to deal with them as singles. On preview: “Jokerman” is pretty great now, but I hated it when it came out, and there are better versions of it than the one that made the album. “Sweetheart Like You” still baffles me a bit, but probably is a good song when all is said and done. As for “Union Sundown”, I already wrote about that one. That leaves only five additional songs. I noted that “License to Kill” has a strange aversion to the space program, which I now know is common to the evangelical Christian movement of this period. This, and “Jokerman”, are among the early indications that Dylan hasn’t left Christianity behind him, he has simply stopped being so overt about it. This one is filled with Christian overtones and references. Musically, I think it’s one of the more interesting pieces on the album. “Neighborhood Bully” is the most overtly political song on the album, and it helps further located Dylan’s mood and politics at the time. This is a strong defense of the state of Israel (the bully of the title), from its enemies. For a man whose only performance the previous year was at a peace concert, this is an odd song to be singing – it is blunt in its praise for Israeli militarism and it calls for a greater level of American military intervention into the Middle East. Again, Reagan Democrat. Musically, though, it is the rocking-est song on the whole album. I like the band here, but I can’t get behind it lyrically. It’s funny, in the 1970s Dylan was accused in the music press of funding Israel with his tours and it was a huge issue. By 1983 it didn’t seem to matter that much to his remaining fans. Probably the most directly religious song on the album is “Man of Peace”. I was listening to this in the car this afternoon with my son as we drove to the mall. He told me “You know, there is also a “Man of War”. I said, “Oh yeah, who’s that?”. Without missing a beat he said, “I’m not sure, but I think it’s a horse”. How do eight year olds learn that? Anyway, this one I straight up enjoy. Dylanesque weirdness abounds (“Well, he can be fascinating, he can be dull / He can ride down Niagara Falls in the barrels of your skull”). Religious Dylan is still good Dylan. “I and I” is, in many ways, the centrepiece of the whole album. This is a cryptic one – I’ve taken to not only listening to it repeatedly, but to reading along while I do. I’ll admit that it confounds me a bit – I don’t see quite what he’s trying to communicate here, other than something about the dualism of the public/private self. Reading Dylanologists, I was struck by one of the quotes where Dylan claims that no one is even close to understanding what he’s saying with his lyrics, and I’m not even close to getting this one. Finally, the album concludes with “Don’t Fall Apart on Me Tonight”, the obligatory (by now) closing love song. I sort of hate this one. It’s whiny, and annoying, and sounds like an ersatz Dylan song. It seems to me that he got that partial phrase and tried to build it into a song and it just didn’t work. Overall, I’d say that this is maybe half a good album, maybe even five good songs out of eight. But that’s mostly as songs. I do have to say that the production still leaves a lot to be desired here. 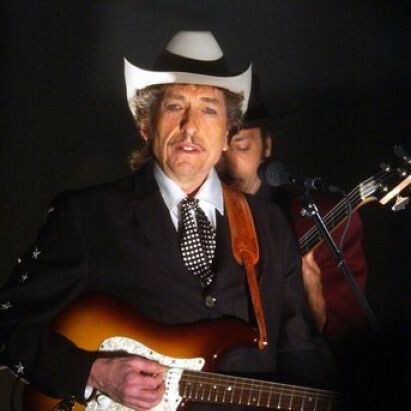 From what I’ve read, Dylan spent the previous summer reconnecting with is son, Jesse, who was sixteen and who was into the new wave and post-punk bands of the period. This exposed Dylan to a lot of new material (Clash, Squeeze, X…). He sought out producers who might take him in a new direction – David Bowie, Elvis Costello, and Frank Zappa (who he met with at the end of December 1982 – wouldn’t that have been something?) In the end he went with Mark Knopfler of The Dire Straits, who he had played with on Slow Train Coming. It’s not exactly the height of cool. Knopfler left for a tour before the final mix was completed, and the album was recut without him. Some of it still sounds a bit rough. To my mind, the band really under performs on most of the songs. It’s an all-star cast here – Knopfler on guitar, Mick Taylor of The Rolling Stones on guitar and Sly and Robbie as the rhythm section. You would think that it would be great, but, really, I think it is one of Dylan’s least interesting albums musically. In fact, if there’s one thing that drives me nuts on the whole album it is the steady rap of Sly Dunbar’s snare drum on almost every song. There’s a sameness to the production that doesn’t really work for me. That said, more of the songs are stuck in my head this week than they have been in a while. Even now “License to Kill” is slowly meandering through the back of my skull while I’m typing. It’s a good album, but it should have been a great one. What went wrong? Come back tomorrow and find out.